Measure voltage, current, and resistance. Voltage Circuit Simulator - This exercise will help you determine the relationship between voltage (V), amperage (I) and resistance (R). This relationship is called Ohm's Law. Draw electric field lines, given a scenario of charged particles. Magnetic Field of a Straight Current-Carrying Wire - This applet simulates an experiment concerning the magnetic field of a straight current-carrying wire. Draw and explain series and parallel circuits. Simple AC Circuits - This Java applet shows a simple circuit consisting of an alternating voltage source and, depending on the selected radio button, a resistor (without inductivity), a capacitor or an ideal coil (without resistance). Identify components of series and parallel circuits and solve problems related to voltage, current, and resistance. Build series and parallel circuits and describe how they function. 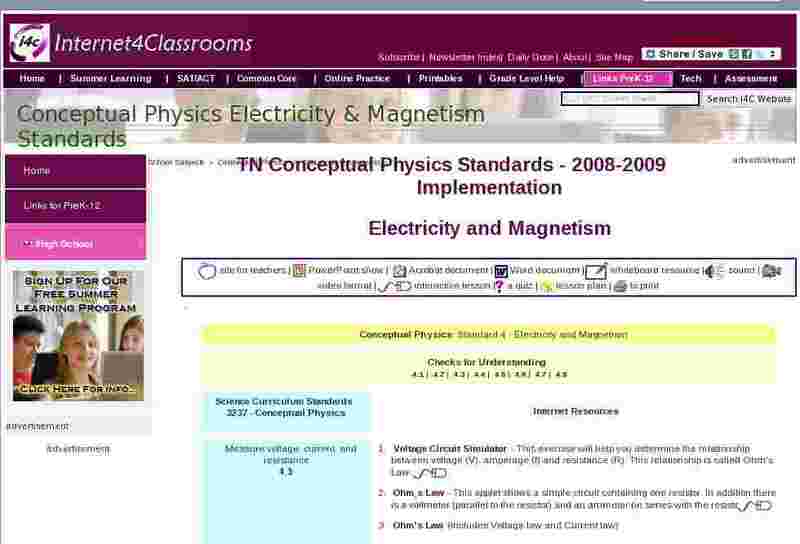 Demonstrate and explain electromagnetic induction. Sketch the magnetic field lines around a bar magnet. Magnetic Field of a Bar Magnet - The magnetic field of a bar magnet can be investigated with this compass needle applet.